PARIS — Pro-European Emmanuel Macron is set to face far-right candidate Marine Le Pen in France’s presidential run-off, results show, making him clear favourite to emerge as the country’s youngest leader in its history. Macron topped Sunday’s first round with 23.7 per cent of votes, slightly ahead of National Front (FN) leader Le Pen with 21.9 per cent, according to near-final results from the interior ministry. "For months and again today I’ve heard the doubts, the anger and the fears of the French people. Their desire for change too," 39-year-old Macron told thousands of cheering supporters in Paris. He pledged to unite "patriots" behind his agenda to renew French politics and modernise the country against Le Pen and "the threat of nationalists". The euro rose sharply against the dollar as fears of France pulling out of the single currency and European Union receded following the breakthrough of Macron, former economy minister under outgoing Socialist President Francois Hollande. An ex-investment banker whose marriage to his former school teacher has fascinated France, Macron said the results were a clear rejection of traditional parties. Neither candidate from the mainstream Republicans and Socialists made it through to the second round for the first time in six decades in a stunning shakeup of national politics. "The challenge is to break completely with the system which has been unable to find solutions to the problems of our country for more than 30 years," Macron said, already eyeing crucial parliamentary elections in June. Le Pen hailed a "historic vote" in front of her supporters, adding: "The first stage has been passed." Macron, who had never before stood for election and only started his grassroots centrist movement 12 months ago, will go into the run-off as the clear frontrunner. New polls released on Sunday evening showed pro-business Macron easily beating Le Pen, who has hardened her anti-immigration and anti-Europe rhetoric over the last week. 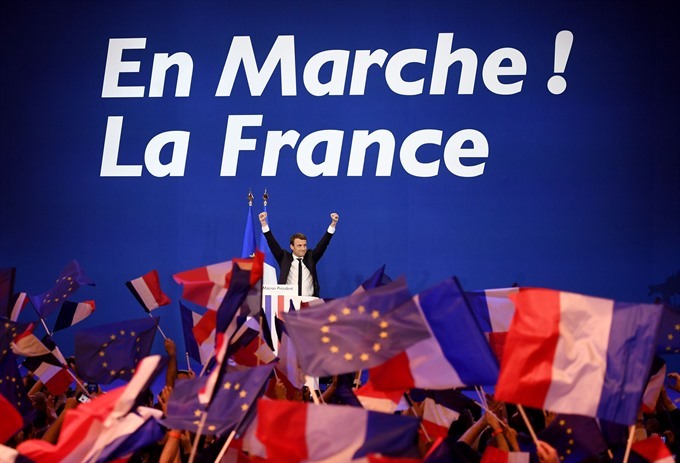 Throughout the campaign, Macron insisted France was "contrarian" -- ready to elect a pro-globalisation liberal at a time when rightwing nationalists are making gains around the world. "It’s a victory for openness, social-mindedness," Macron supporter Marie-Helene Visconti, a 60-year-old artist, said at his election party where the EU flag was waved alongside the French tricolore. "The major issue of this election is runaway globalisation, which is putting our civilisation in danger," she told supporters. "Either we continue on the path of complete deregulation, with no borders and no protection... mass immigration and free movement of terrorists... or you choose France," she added. Far-right expert Nonna Mayer at Sciences Po university said a Le Pen victory was not impossible, "but it seems unlikely that she will carry the second round".